At first glance this cat may not seem that unusual but in reality this cat is very unique. His ears curl backward and down which only occurs in this breed of cat. But for a perfect breed the ears can only curl so far, if they curl so much that they touch the skull they are disqualified from shows. This breed was begun in the 1980s but has already gained quite a bit of popularity. This is another cat that is considered to be very unique because of its ears. This cat’s ears do not grow very much from the time the cat is a kitten and they never stand up, rather they fold down at about three weeks of age. This cat is perhaps one of this most adorable that you will ever see because they keep their small ears which makes them look like a kitten throughout their entire life. This unique breed of cat is actually prized because it looks so much like the endangered Ocelot. This cat was the result of an attempt to breed Abyssinians, Siamese, and domestic short-hairs together. The first Ocicat was white with numerous spots but others have earned the orange coloring that gives them appearance that is even closer to that of the Ocelot. A great thing about Ocicats is that their owners have often equated them to dogs for their train-ability and temperament. If you want a dog but want the lower responsibility of a cat, then the Ocicat may be just what you are looking for. This unique cat has very long fur which is designed to make it last through the freezing cold winters of Norway. These cats actually accompanied the Vikings as they sailed around the world. They are very loyal to their owners but they need lots of interaction because they are excellent hunters. This cat is very unique because of two reasons. The first is that this furry cat has absolutely no tail. The second is that this cat’s back legs are longer than its front legs which means that it has a very unusual walk that a some people say resembles a bunny hop. Many people like this cat for its unique character and the fact that it has such a strange walk. The Manx is also a relatively small cat and can come in just about any color combination. This adorable cat is truly unique in that is has very short little legs. These cats were first observed in the 1940s but then they disappeared after the war. They reappeared after two munchkin cats were found in the 1980s and they were bred. Despite their short legs these cats can do everything that normal cats can. If you like the look of the Spinx but would rather have a cat with at least a little fur, then the Cornish Rex might be for you. This cat has short curly fur that really makes it unique among cats and they are popular among people who suffer from allergies because they lack the hair that is present on most cats. This is a relatively new breed of cats as they were created from the genetic mutation of a litter of cats in the 1950s. This strange cat is perhaps one of the most popular among strange cat breeds because this particular cat has made an appearance in a few movies as the pet of evil villains. The reason for that is pretty clear because this cat can definitely look evil if it wanted to. 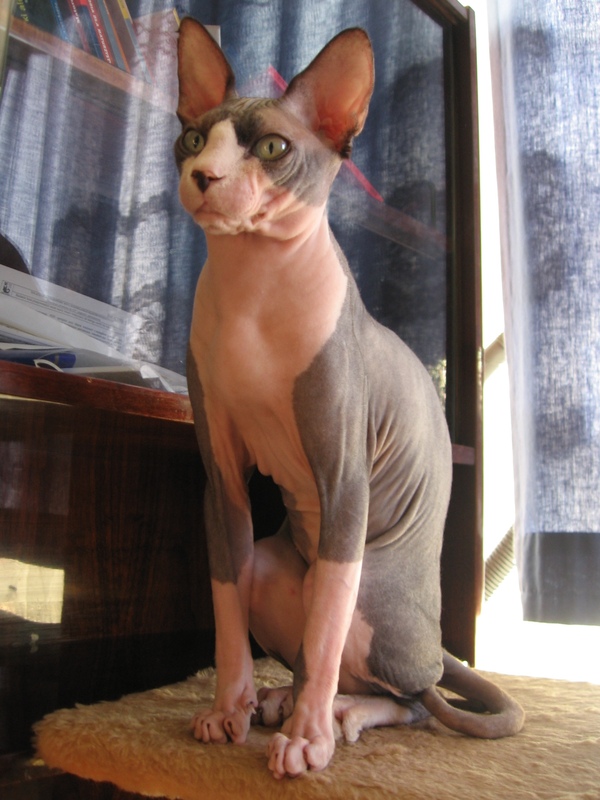 But if you want a cat that is so ugly it’s cute the Sphinx is for you. This cat looks very similar to the Cornish Rex but they have no genetic relation. They have soft down fur that is very curly. They are also known for their very large low-set ears and very large eyes. This unique cat is very adorable and is a far cry from the appearance of a regular short-haired cat. Another unique attribute about this cat is that they loved to sit perched on their owner’s shoulder just like parrot. They are also very playful and friendly cats. While these cats may look truly bizarre you can be sure that no breed can compare to the random abnormalities that can occur in certain litters. This is evidenced by the cat that has been affectionately dubbed the ugliest cat in the world. Ugly Bat Boy lives in a Veterinarian’s office in Boston and is said to be a very affectionate cat for anyone that is willing to look past his rather…unique appearance.